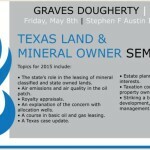 Our firm will host a seminar in Austin for land and mineral owners on May 8. Open to the public, but you have to register. You can register here.